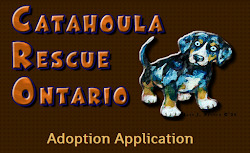 Catahoula Rescue-Ontario: Meet Patches - Adopted! Patches is a wonderful girl, we think she is around 2 years old and our best guess for breed is Australian Shepherd and/or Catahoula mix. She weighs approximately 40 pounds. Patches is very loving and loves to cuddle up with her fosters. She gets along wonderfully with her foster sister (a Catahoula mix). She can be a bit over zealous in her meetings with other dogs on leash, but her foster family is making some progress on this front. 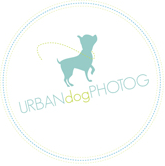 She does best with play dates and good doggy friends. She is crate trained and house trained. She is learning to run with her foster mom and is a great partner and motivator to get out and hit the trails! She is also a great sous-chef, ready to help clean up any messes in the kitchen! Patches is spayed, up-to-date on shots, heartworm negative, and microchipped.